Humble has launched a new Star Wars comic bundle including 12 digital trade collection encompassing a collected 89 single issues from various series. Do you like Star Wars? I'm going to go ahead and assume that if you clicked on the link leading to this story that yes, you indeed do. That being the case, we're also going to bet that you might have read a comic book or two based on the franchise over the years. Heck, there's been so many of them that it might even have happened by accident. Maybe you were just sitting on a bench, minding your own business and an issue of a random Star Wars series dropped into your laps from some unknown point in the heavens. It might even have been the will of the Force. 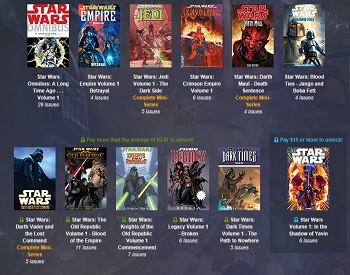 Regardless of how they happened, if your experiences reading Star Wars comics left any sort of impression on you, you might be interested in the still going Humble Star Wars Comics Bundle which contains digital collections from a whopping twelve different Dark Horse Star Wars comics from over the years. Among the included content are first volumes of Star Wars: Omnibus, Star Wars: Empire, Star Wars: Jedi, Star Wars: Crimson Empire and more. Of particular note to me personally are the trade collections of Star Wars: Knights of the Old Republic and Brian Wood's recent (and excellent) Star Wars book. To unlock all of these (89 comics total) it costs a mere $15. A second lower tier is also available for individuals interested in buying most but not all of the books. As with all Humble Bundles, consumers can also pay a custom amount to receive six books instead of twelve. The full selection can be found on the bundle's official page. All in all, if you have even a slight interest in checking out Dark Horse's extensive work with the Star Wars franchise, this is about as fantastic a sampler as you're going to get. Granted, it doesn't encompass everything the publisher has done, but for $15 you'd be hard pressed to get a better deal on a collection like this. If nothing else, buying it would be a nice way to catch up on some of Dark Horse's work before Star Wars heads over to Marvel in 2015.